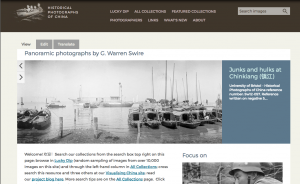 Today marks the launch of a new platform for ‘Historical Photographs of China’, complete with a new address, www.hpcbristol.net, an additional 1,400 images from 9 new collections, and another 4 starting to be brought online. After ten years of the current platform we felt that it was time for a change. We could not remain more grateful to our colleagues Professor Christian Henriot, and Dr Gérald Foliot, who have provided support and server space since the project launched in 2006. We concluded, however, a couple of years ago, that long-term sustainability of the archive (currently three times as large as the collections available online), meant that we should develop a repository hosted at Bristol. The new platform also allows us to streamline the process in a way that cuts out one stage in the technical processing of images and metadata. This will, we hope, allow us to release more of our backlog of digitised collections through the site. Keeping it simple remains the motto. Our only obvious new additional function is a ‘Lucky Dip’ page, providing a random sampling from the collections. You really will never know quite what you might chance on there. Certainly, regular visitors may notice our new collections, including a large and diverse selection of photographs from Shanghai-based news photographer Malcolm Rosholt, the family photographs of Sikh life and work in Shanghai in the Ranjit Singh Sangha collection, and some of Felice Beato’s photographs of the bloody 1860 North China Campaign. Mao Zedong, Rabindranath Tagore, the Tenth Panchen Lama, General Sir Robert Napier, Father Jacquinot, Kong Lingyi (a 76th generation lineal descendant of Confucius), and sometime North China Daily News editor R.W. Little join the cast of personalities. The new images range from 1860 (with some earlier ones on their way soon), to 1949 (with some later ones on their way in the not too distant future). A less obvious new feature is a ‘Related Photographs’ link that provides thumbnails of photographs obviously linked to the one displayed. We cannot say that coverage through this is comprehensive, but we are linking photographs where we can (where, for example, they might be split across albums, media (negatives and prints for example), or even collections. So please update your bookmarks, and do please tell us what you think — you can email us at hums-chinaphotos@bristol.ac.uk — we are always interested to hear how you use the site. Developing the platform has been supported by awards from the British Academy, the Chiang Ching-Kuo Foundation, and Swire Trust, and with vital support from the University of Bristol’s IT Services. We are grateful to its Director Darrell Sturley, Deputy-Director Rachel Bence, and to our colleagues who have co-ordinated or who have built the new platform: Dr Simon Price, Pete Boere, Mike Jones, Paul Smith, Virginia Knight, Tessa Alexander, Damian Steer. As well as their technical expertise, our colleagues have also brought a great deal of enthusiasm and commitment to the initiative. And of course we remain grateful to the scores of families who have contacted us and offered collections. Next up: an overhaul for http://visualisingchina.net/. This platform, unveiled five years ago now, with funding from JISC, searches across different repositories, but the underlying technology is creaking. This will be rebuilt using the same system that has powered the new Historical Photographs of China. This entry was posted in About us, Design, New Collections. Bookmark the permalink.